How to Identify and Prevent Cyberbullying. Today’s kids are spending more and more time online in chat rooms, texting via cell phone, and using every digital gadget available to them to communicate with their friends. Not only are they chatting with friends from their schools and neighborhoods, but they’re also meeting new people online and talking with them, too. In most cases the chats are fun and friendly, but there is a growing concern over a dark side of these digital discussions: cyberbullies. The National Crime Prevention Council defines cyberbullying as: “Online bullying, called cyberbullying, happens when teens use the Internet, cell phones, or other devices to send or post text or images intended to hurt or embarrass another person.”. Emails, IM‘s, Twitter posts, text messages, MySpace pages… any digital resource can, and likely has been, used for the purposes of cyberbullying. Warning signs of cyberbullying and harassment. There’s a large variety of ways that a bully can harass a victim online. A few examples are creating or altering photos in a suggestive manner, continually sending the victim hateful messages, rallying a larger group of people to humiliate someone, and spreading false rumors in order to hurt or embarass the target. At the first sign of any of these, or other unusual behavior, parents, teachers, and other responsible adults should take note and talk to the child. Catching these things early is a key to prevention. And if you come across any bullying, make sure to save any evidence (save emails, print the screen with chats, etc.). How do we stop cyberbullies? Early detection of harassment is key, though it’s not always easy to find. Staying on top of your child’s internet and cell phone usage is one way to be in the loop. And don’t worry about keeping tabs: it’s not snooping or invading their privacy, it’s looking out for their well being! Talk with your kids and let them know the ramifications of cyberbullying: fear, embarassment, and other negative reactions. There are plenty of examples of fair use contracts between parents and children online that have clear, concise rules of internet and cell phone usage. Find a few examples and discuss them with your kids so that they know what is expected of them and get a written promise of compliance. 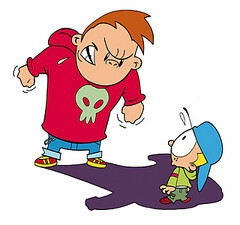 Red flags that show up when a child is the victim of a cyberbully include (but aren’t limited to): being nervous when downloading emails or IM’s, becoming angry when online (or just after going offline), being uncharacteristically withdrawn from friends and family, the unexpected absence of any cell phone usage, and avoiding any time online. Keep an open door policy with your kids so that they know they can come to you at any time to discuss problems that may arise both online and offline.